Easter time is here again. 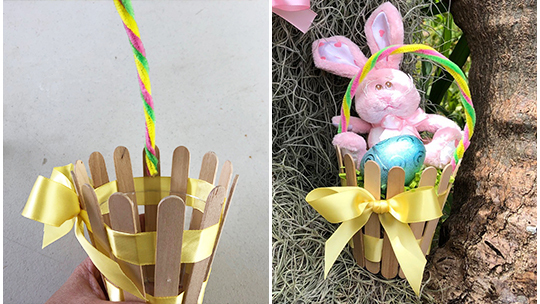 This year, gift treats to everyone in these adorable baskets that you can create in minutes. Encourage your youngsters to decorate theirs for a personalized touch. 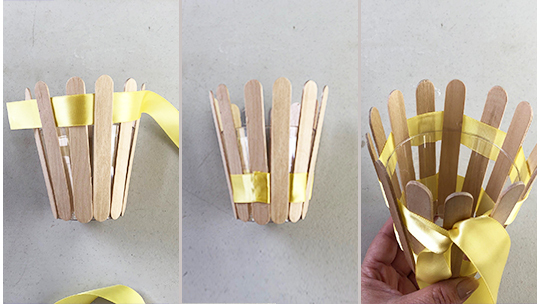 Whether you’re making one or a dozen, these baskets are quick, easy, and cost efficient. And it doesn’t take much to fill them up due to their modest size. They’re guaranteed to make the Easter Bunny proud. Place a dollop of hot glue on the outside of the cup near the base. 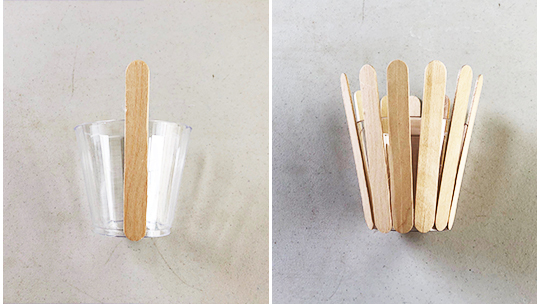 Place one craft stick on the glue and align with the bottom edge of the cup. Continue gluing the sticks around the cup. Note: Apply glue only at the base of the cup. Weave ribbon through the craft sticks at the top then slide it down to the base of the basket. Cut ribbon and secure. Repeat, this time keep the ribbon about a half inch from the top. Tie a bow and trim the excess. 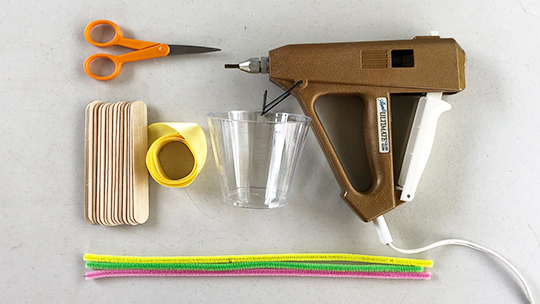 Note: It’s helpful to glue the ribbon to the craft stick to prevent it from moving. Tightly twist together three pipe cleaners at each end. Use hot glue to attach one end of the handle to the inside of the basket. Secure the other end of the handle to the opposite side. Done and ready to be filled with goodies. Whether they’re given to kids or adults, they’ll surely make “anybunny” smile.